The best, luxury, city centre holiday accommodation in Brighton, Cambridge and Nice. Monaco Grand Prix… for Free! Here’s a secret: The most glamorous and prestigious racing event in the world, the Monaco Grand Prix… has a free day. It’s not publicized and most locals don’t even know about it, but the Friday before the big race is always free, with all of the same noise, smells, vibrations, sensations, crashes, and excitement… but no ticket required. ​Take your earplugs: the GP2 has 42 breakneck laps roaring through the just-over-two-mile-long course. In 2010, the fastest lap of the weekend was 1 minute 15 seconds, so you have constant action with each race car screaming by every minute or so (check out the video below for a drivers seat web cam). Move around and try out different seats and vantage points (normally costing 100’s of euros), so if you ever do buy a ticket, you’ll know where you want to be. After the races, go have lunch. The streets reopen to the public at around 2pm, and then you are free to walk along the track and even peek into the pits… and while you’re at it, take a stroll on the docks to check out the mega-yachts in for the races. Here is the official race schedule and ticket information, but note that there are no tickets showing for Friday… because it’s free! How to get there: To get to Monaco during the race, you can either take the train or take bus #100, but even with both modes of transport reinforced to the max, it’s still sheer madness, especially on the way back. With the money you save on ‘free day’ you could opt to splurge on your transport, and take the boat from Nice to Monaco for 60€ round trip. Okay, so it’s not a super-yacht, but it would still be far more enjoyable to arrive on the top deck of a stunningly beautiful 40-minute coastal cruise, than packed like sardines in a bus or train. Reservations are a must. Monaco hosts a series of Grand Prix type races in the course of the year, so here is the official Automobile Club of Monaco link in English to find out more. We visit Brighton all the time, and we can’t resist taking a visit to the pier, strolling along the sea front and pottering around the historic Brighton Lanes. But sometimes you need to do something a little different. Here’s six ideas of things we love and we think you’ll find a bit different to spice up your next trip to Brighton. 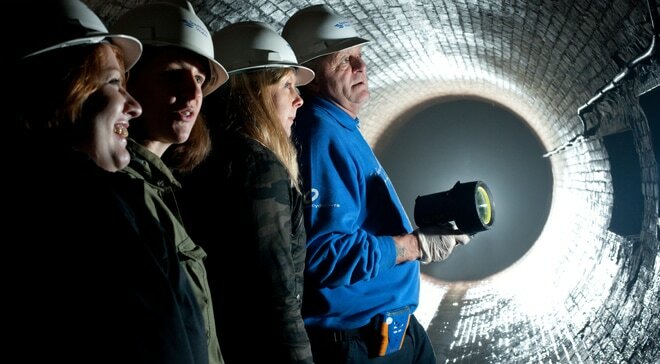 Brighton’s famous sewer tours have been running for more than 50 years. Discover their Victorian fascinating secrets from 150 years ago by walking through the labyrinth of tunnels. The award-winning tours run from May until September and are a popular attraction with visitors from across the world. The Undercliff Walk boasts some stunning scenery and extends for just under three miles. You set out from Brighton Marina and walk along to Rottingdean before heading onto Saltdean. The walk runs along the top of the sea wall which was built in the 1930s to prevent the chalk cliffs eroding. In the Summer the path is full of flowers including sea lavender, ragwort, field bindweed, red valerian, wild carrot, common thistle, common mallow and common vetch. 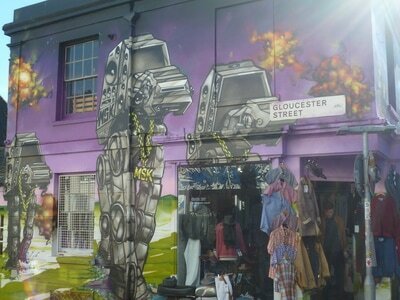 The Brighton Lanes is a fantastic place for shopping, yet beneath its convivial veneer darker forces are at work. Join actor and master storyteller Rob Marks as the eccentric Silas the Ghost Walker, or his fellow ghost walkers Jasper and Ebenezer, for a 70 minute walk around Brighton’s famous Lanes visiting eight haunted sites. Experience a different flavour of this quirky and spirited city whilst discovering a selection of popular foodie Brighton hotspots. 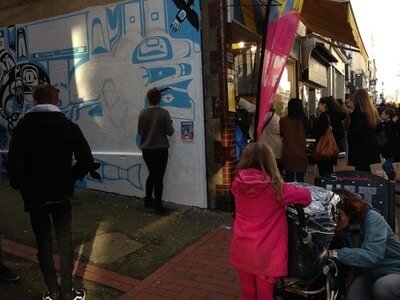 Get off the beaten track to meet some of Brighton’s most exciting and unusual independent vendors and producers. Hear the stories, passions and politics behind their products and best of all, try some tasty samples. Take the no.77 Bus to explore Devil’s Dyke and the Southdown’s National Park. Enjoy the great outdoors, beautiful countryside and many special events held at the Dyke. Maybe not so new now, as the i360 has been running since early 2016, but you can still only do this in Brighton, so it must be different! Take to the skies to see Brighton and the beautiful south coast as you have never seen them before. Glide up gently to 138 metres on the world’s tallest moving observation tower, to admire 360 degree views across Brighton, the South Downs and, on the clearest days, all the way to the Isle of Wight. Sun's out in brighton and we're on the beach! The sun's out in Brighton, and after quite a cold Winter, we really needed this to lift our spirits. 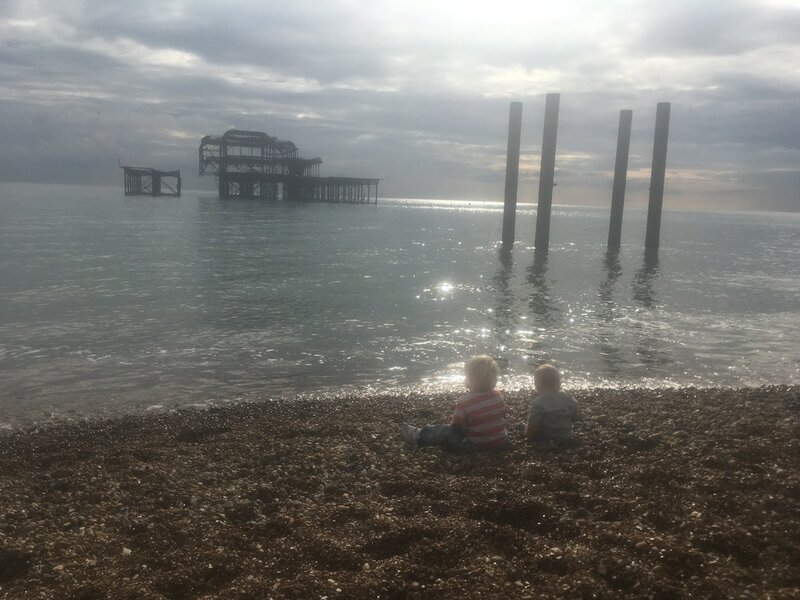 There is so much to do here all year round, but nothing beats sitting on the beach in front of the famous but degrading Old West Pier, and soaking up some warm sunshine. 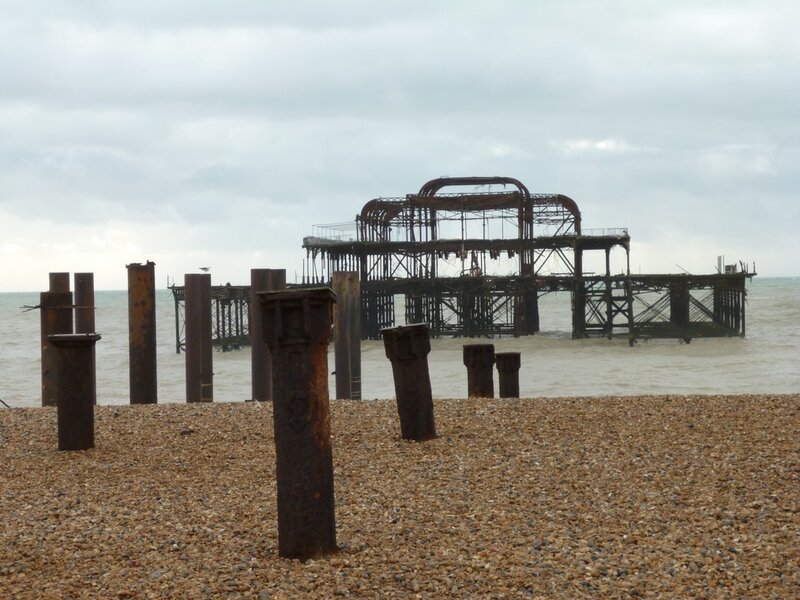 This has to be one my favourite spots, and I do wonder how much longer the Old West Pier will be here for us to look at. 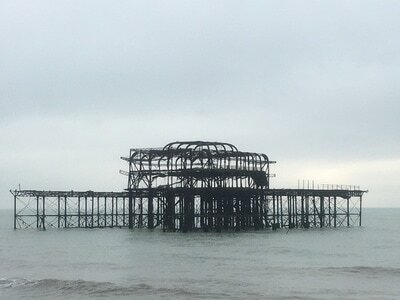 Slowly but surely, the weather and the waves batter the ghostly structure. Piece by piece, bits of metal fall into the water, never to be seen again. Soon it will just be a memory, cherished in the many photos that have been taken over the years, documenting it's slow decline. The kids love it too. For slightly different reasons. They never get tired of popping stones into the water, trying to get them to skim the surface, bouncing in and out of the waves. And probably because they know that being on the beach means there's usually an ice-cream involved, or some scrumptious fish and chips. Brighton is famous for its fish and chips, and there's nothing better than digging into an open bag, wooden fork in hand and ketchup at the ready, with the sea-front to admire. 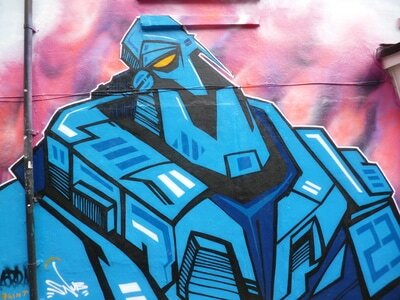 Brighton has been known for its talented graffiti artists for some time, and has earned itself an international reputation over the last few years for its stunning and original graffiti artwork dotted around the city. 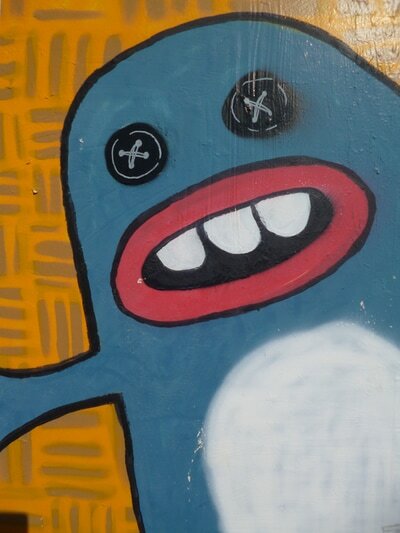 Simply wander around the city and the sea-front, where you will notice many impressive pieces of street art on walls, bridges, construction sites, cabinets. Music mural - famous musicians adorn the side of the Prince Albert Pub in Trafalgar Street. Replica of Banksy's 'Kissing Policemen' - Prince Albert Pub, Trafalgar Street. Super Mario - nostalgic gamers will love the mural of Bowser and the mushrooms from the Super Mario games. Park Crescent Road, near London Road. 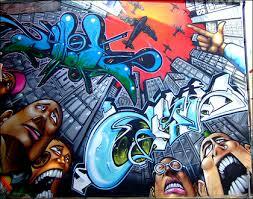 Run DMC mural - features a giant chessboard created by well-known British street artists Odisy and Aroe. Kensington Street, North Laine. Star Wars - Even rubbish bins can be a canvas in this creative city! Look out for the bin which is an homage to Star Wars. The Open Market, London Road. 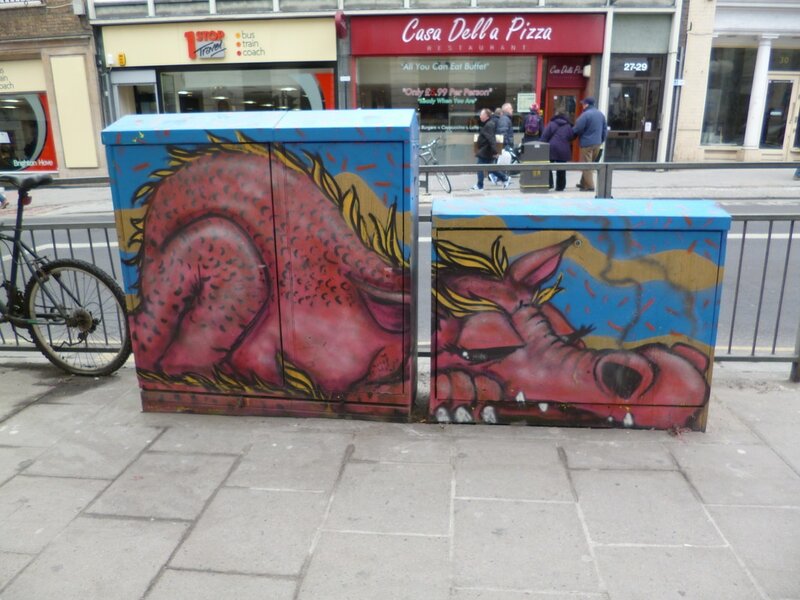 Giant blue fire-breathing dragon - adorns a hairdressers on the corner of North Road and Robert Street. Created by Odisy. 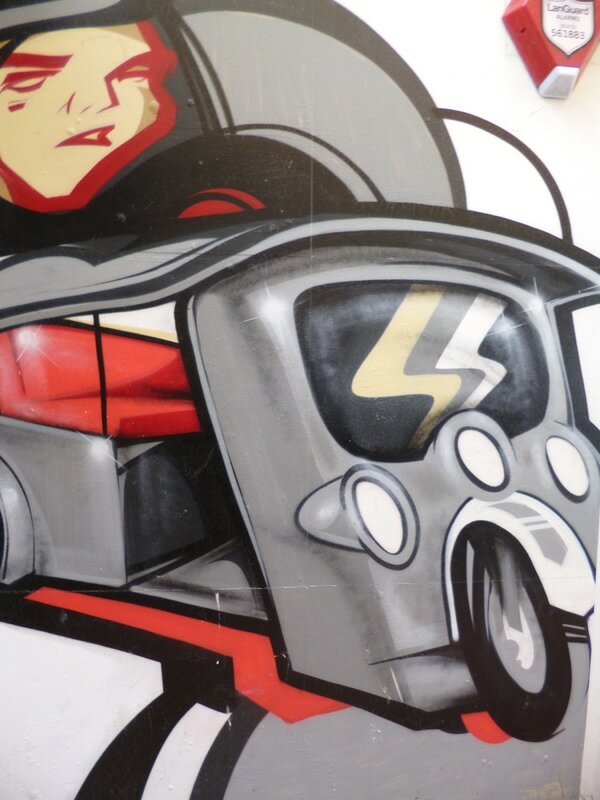 The Hair Cutter - completely covers a wall in St George’s Mews. 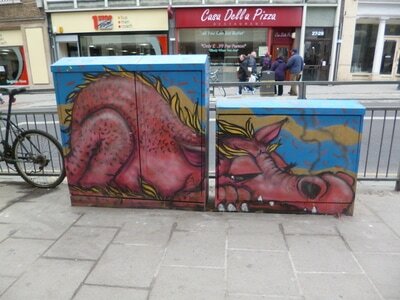 Created by artist Snug. Urban Art Wall - started in 2005, this art wall is a centrepiece of New England Road. 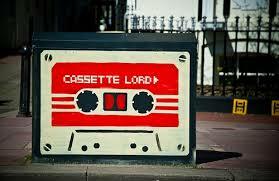 Cassette Lord - you don't need to go far in the city to spot a cable box playfully decorated by community street artist Cassette Lord. 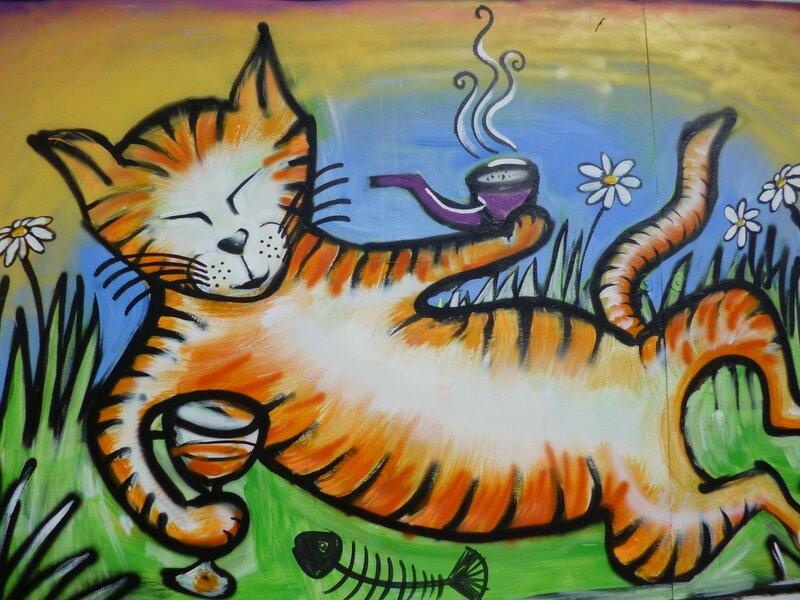 Mural at Black Rock - an ever-changing 'unofficial gallery' on the wooden hoardings beside Brighton Marina reflects Brighton's lively graffiti scene. For a start, you must not be a slave to your guidebook. 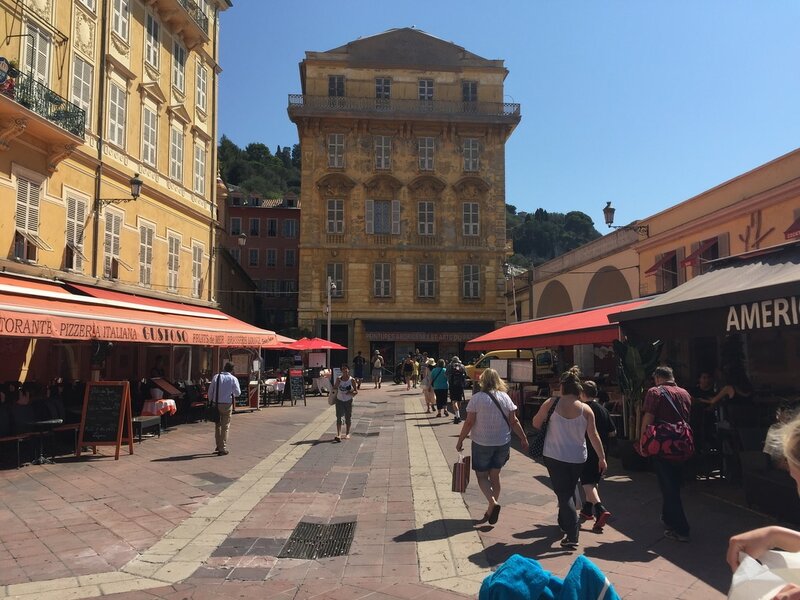 Nice is a wonderful city, and by just strolling around it's Old Town and the sea front, you will experience the very essence of the life and culture. In the Old Town itself, one narrow, cobbled street will lead onto another, and finding your own way around is a journey in itself. An abundance of fabulous restaurants and boutique shops, galleries and cafes. Discovering the local secrets yourself is half the fun. It was quite by chance that we both happened across the Art Market for example, where we bought a beautiful original that hangs in our house in England. It was also quite by accident that we passed The Hotel Negresco, and decided to go in for a drink. What an amazing place, the memories made more special by the unplanned nature of our visit. I'd like to claim that the many drinks we've enjoyed on the beach front were also accidental, but of course that would be a lie. One of my favourite evening activities in Nice - watching the sun go down with a glass of chilled wine in my hand and the sea gently washing in and out. None of these will disappoint. 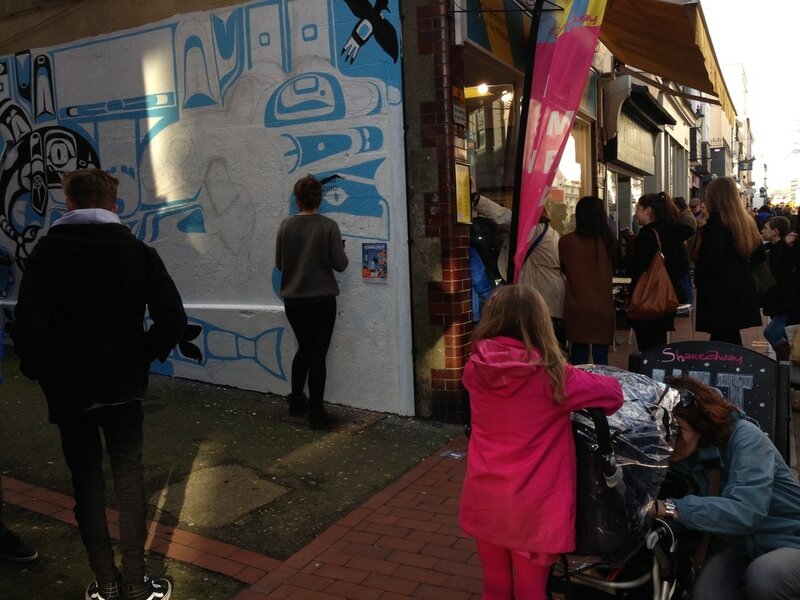 How would you describe Brighton, it’s culture and the people? 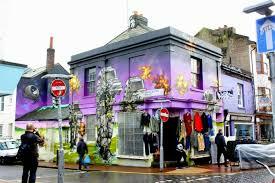 Brighton is a vibrant and culturally rich city, which is home to a diverse and multi-national population. It also attracts visitors from all over the world who come to experience this beautiful seaside destination, with its endless attractions. Brighton is packed full of theatres, bars, restaurants, shops, art galleries and amusements and boasts an enviable range of authentic, international cuisine. 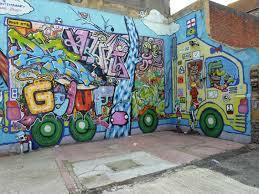 What are some of the places in Brighton that you think first-time visitors should check out? The beach front is a definite for visitors. 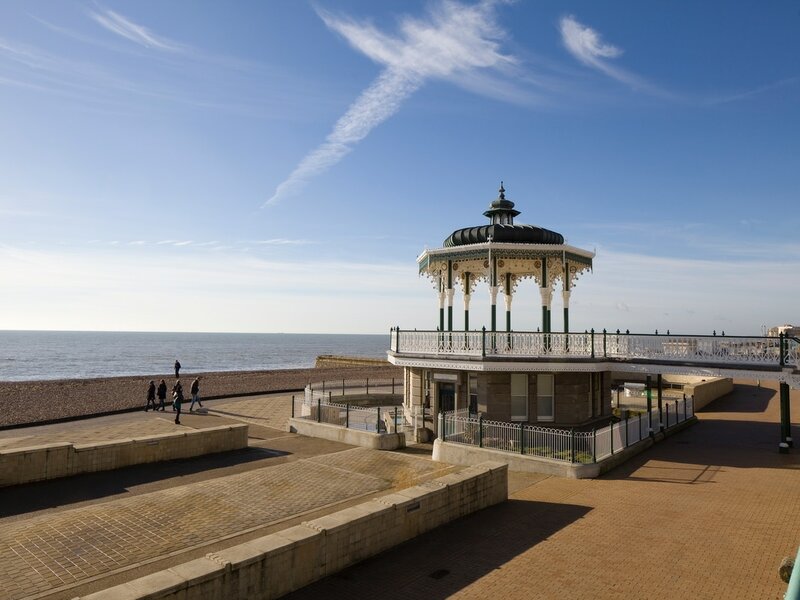 Not only are the sea views stunningly beautiful, the promenade is lined with art galleries, boutique shops, cafés, bars and fish and chip shops. A walk along Brighton's famous pier will take you past amusements, candy floss, restaurants and fair ground rides for the children or thrill seeking adults. There's also the Sea Life Centre; an underground giant aquarium with over 150 marine creatures from all over the world. How long have you been renting your property(s) and why did you choose to start? We've been renting our holiday apartments for about two years now. 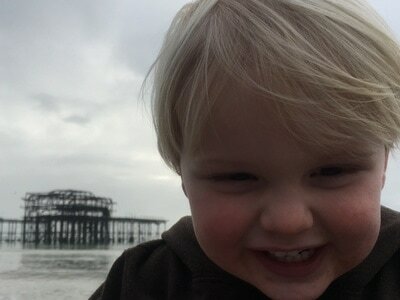 Our family love Brighton and never tire of the views and attractions. There's always something to do! So initially the first apartment was for us to enjoy affordable holidays by the sea. Then we thought it would make sense to rent the apartment out when we're not there. Holiday makers loved our apartment so much we were persuaded to take on a second one. 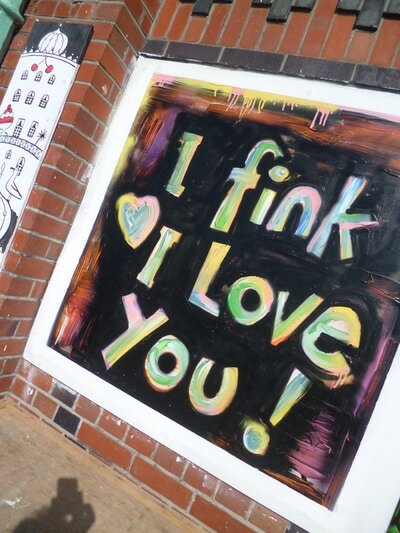 What do you love about your property's neighbourhood? Both our apartments are right in the heart of the city, but in residential buildings so you get the best of both worlds - great views with everything on your doorstep, but with a lovely quiet haven to come back to when you retire from the busy city. Being so high up, you're more likely to hear the seagulls than the noise from the streets and bars. What is your favourite local restaurant and why? Our favourite restaurants are the small, authentic Asian eateries. There's one on Preston street called Kanok Thai where friendly staff serve delicious Thai food. There's plenty of non-spicy food if you prefer. The funky New Club is also one of our favourites and is fantastic for coffee, cocktails and gourmet burgers. Do you have any plans to improve your rental home, or add features to it, in the future? We're always making improvements to our apartments to keep them looking fresh and up-to date. We currently have plans to build the decking area on the balcony in the Astra apartment. I's huge and has beautiful views. It deserves to be given special attention so our visitors can enjoy it even more. We frequently find new artefacts and ornaments on display in the apartments. It's quite bizarre but also rather lovely, almost like a gift from our visitors. When going on vacation, why would you choose to rent a house / apartment as opposed to staying in a hotel? Apartments are a lot more homely than a hotel room. It means everyone can sleep comfortably and safely behind the same locked door. Most of the time it's no more expensive but you have so much more room. Our apartments each have a kitchen, a sitting room, a bathroom, and a balcony. You can cook what you like and when.it. I have to say that as we take our usual long walk along Brighton sea front, a lot has changed over the last few years. Just across the road from the apartment, you'll find the much-loved, colourful archways have been replaced with some beautiful new boutique shops, cafes and other building projects. Actually these make for a perfect mooch if you're in the mood or you're looking for a unique present. I miss the arches but I have to admit that these new shops are a welcome addition. Even though I've been there many times now, nothing beats pottering down at the weekend - past the coffee shops to grab a latte, and then in and out of the little treasure troves. If it's sunny, which it always seems to be when we're in Brighton, there's a great excuse to stop for an ice cream while you watch the waves and soak up the sea air - that will never change! And of course, right next door, there's the best playground to exercise the kids if you have some, complete with paddling pool in the Summer. 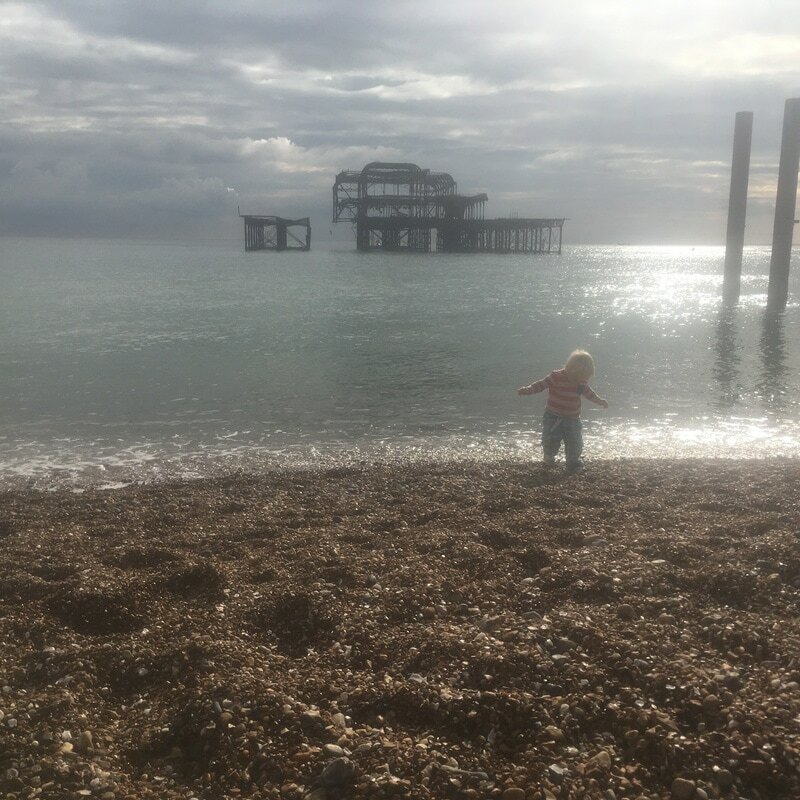 But you can't beat throwing stones in the sea as you soak up the atmosphere with the sea breeze and the hauntingly beautiful remains of the Old West Pier. This has got to be my favourite view, and the one thing I photograph the most when I'm in Brighton. Perhaps one of the bigger changes is the building of the new i360. This has been a controversial project, not least because of its size and the impact it has on the view, not just from the sea front. This has been designed by the same architects behind the London Eye and standing at 450 feet, you can see for 26 miles around. It's definitely worth a look. This huge addition has a fully enclosed aerodynamically shaped futuristic glass viewing pod which will enable guests to see for 360 degrees around. We've all been up already, and the view is pretty amazing.